I laughed so hard I fell on the ground, lay back on the grass, and roared. So we were at the park in Austin this weekend hanging out Sarah’s brother and his friend. Tossing around a frisbee and enjoying the nice weather. A playful, athletic yellow-lab mix runs over to us and starts barking at the frisbee. The dog rips the disc out of Julie’s hand and makes a dash across the grass. No owner in sight. It was a friendly dog. Just a little over-zealous. Josh finally manages to get the lab to release the plastic frisbee, which is now nicely decorated with several puncture holes from the dog’s teeth. Our game of catch is now over. The dog is not finished playing. He comes back over to us (still no owner in sight). We finally shoo him away and he trots off, looking for more entertainment. He starts rolling in a puddle of mud. That’s when he spots the boy. On four muddy paws, the lab bounds over to the kid and his family who are watching the father try to get the boy’s kite in the air. 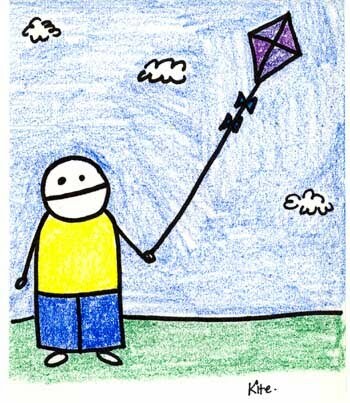 The kite is twirling and spinning, struggling to stay aloft in the light breeze. It’s just out of reach of the lab, who is launching himself upward with all four feet coming off the ground as he snaps at the tail of the fluttering kite. The wind fails. The kite falls. The yellow lab mauls the boy’s kite using his forepaws to pin it to the ground as he rips shred after shred of red fabric from the frame. And I laughed. I laughed so hard I fell on the ground, lay back on the grass, and roared. I sat up and watched the dog drag the remains of the kite back to the mud puddle. The boy’s face looked like he was watching the murder of his pet rabbit. We all laughed at the yellow lab who was having fun in the park at our expense. OK. There’s my Friday ConFession. I feel so much better. Anything you’d like to ‘Fess? You’ll feel better if you do…. This entry was posted in Uncategorized. Tagged ConFession Friday, humor, kite, sarah, texas, yellow lab.